A casual but distinctive daytime scent from the iconic Burberry, Burberry Brit cologne for men is a spicy, moderate fragrance that carefully balances an expanse of citrus notes with woodsy undertones. 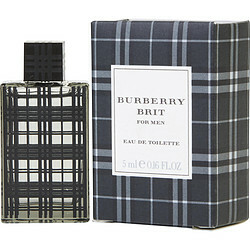 First introduced in 1988, Burberry Brit has a rich, appealing construction that combines notes of green mandarin, ginger, bergamot, wild roses and cedarwood with nutmeg and oriental woods. This appealing and resonant fragrance is the perfect choice for a broad variety of daytime events. I have been using burberry brit for a long time. I think the product is well made and I enjoy the fragrance. However, I can't find the the same scent in aftershave balm. Is that available? Nice but Burberry Touch better. I’ve used Burberry Brit for years and it’s nice to see I can order it in larger sizes and reasonable prices !!! !